Small bits inside, best to work on in a bucket. 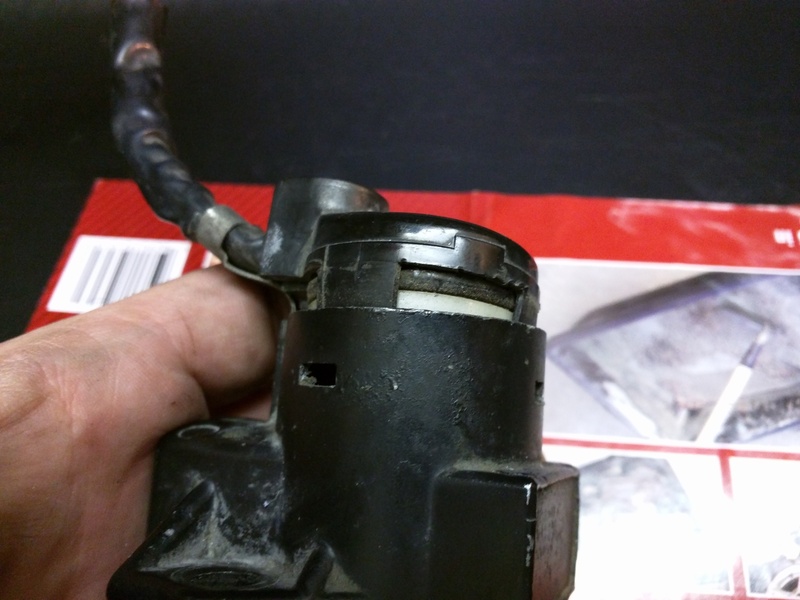 So I removed the ignition switch to see what went wrong. An old friend pointed out that there are small bits springloaded inside the switch, so I figured it was best to work on this inside a bucket. Depress the 3 tabs to remove the end cap. The end cap is held in with 3 tabs. Depress all 3 and gently pry along the seam to remove the end cap. Don’t worry, nothing will fall out just yet. 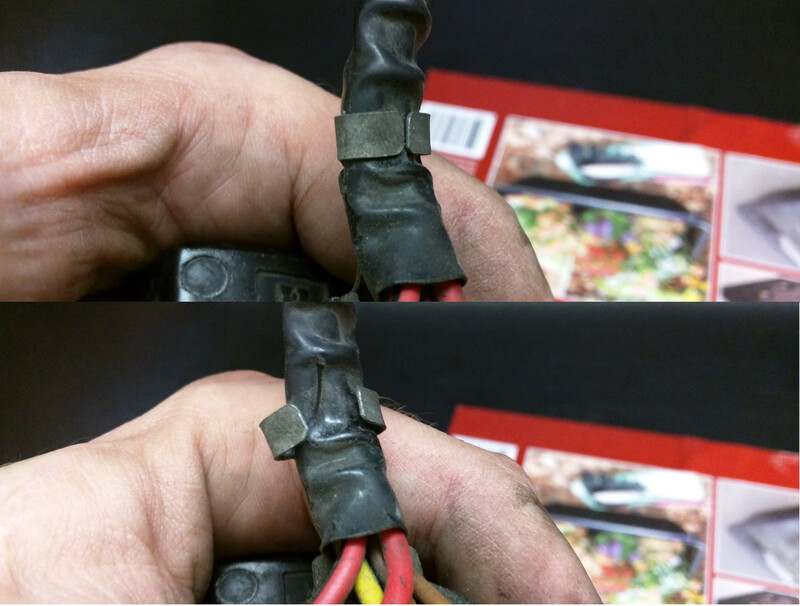 Gently pry open the wiring harness clip. 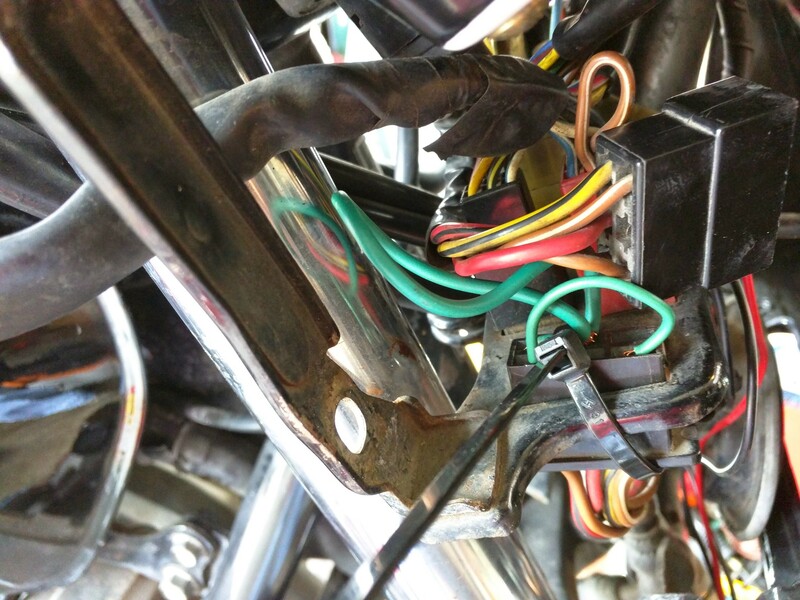 There is a metal clip holding the wiring harness in place. Gently pry it open to remove the wiring bundle. Ignition switch now in two pices. 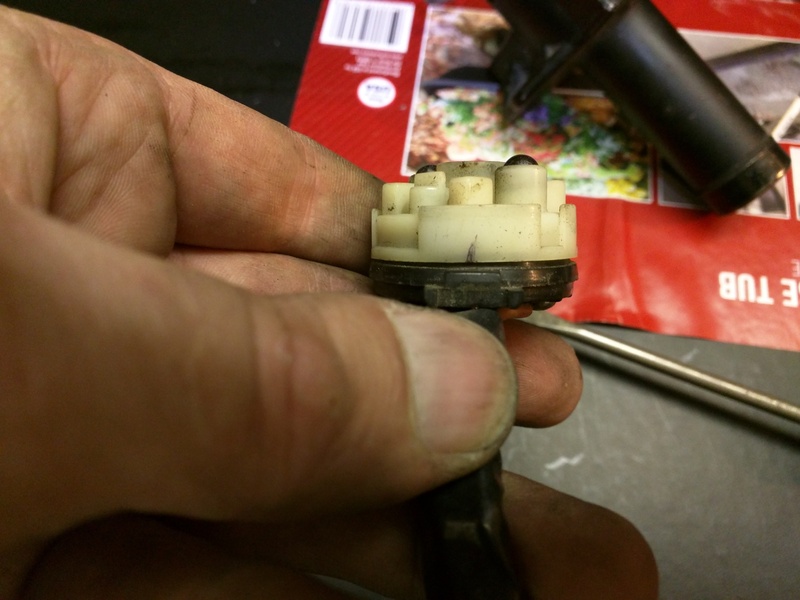 The ignition switch should now be in two pieces. Take the barrel part and set it aside, you do not need to take that half apart any further. In a rare moment of foresight I decided to make a mark on the switch oriented into the OFF position. 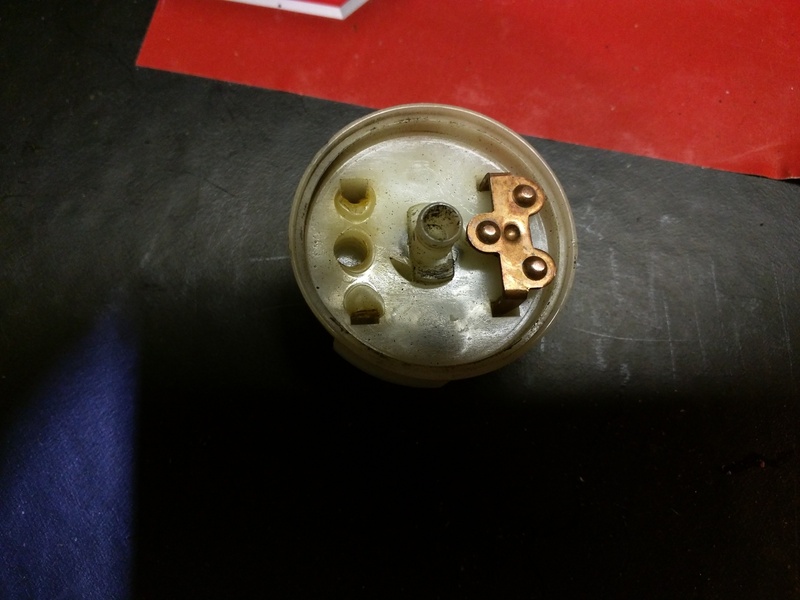 This proved helpful during reassembly. This is where small bits fall out. Now gently twist and pull the white disk away from the black disk. This is the part where small spring loaded bits fall out so be ready for it. Those copper jumpers in the white disk have springs behind them to press them against the contacts on the black disk. If you look closely you can see exactly what left me stranded. The jumper on the left is still depressed while the other one is pushed out. It came out easily with some prying but wouldn’t pop out on its own. 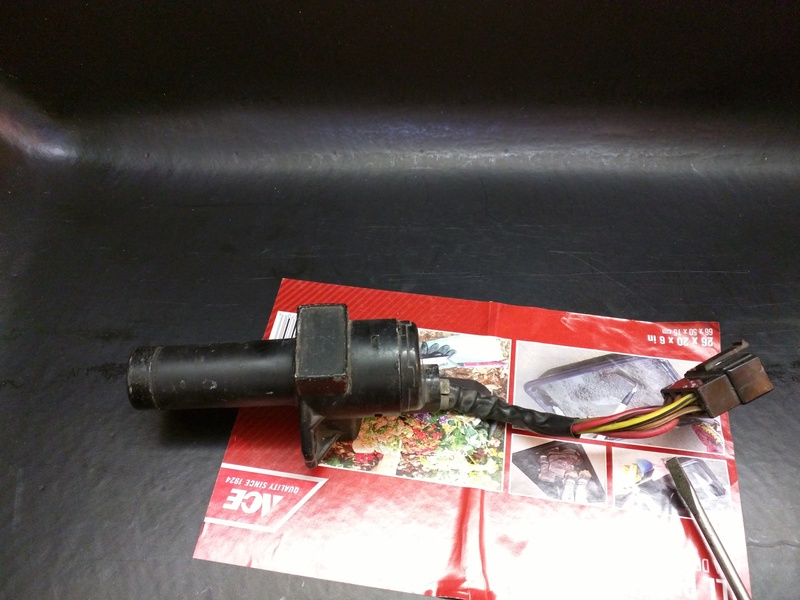 This prevented the switch from closing the Red -> Red/Black wires powering the ignition circuit. The melted plastic is why the jumper wouldn’t make contact. The plastic disk melted and deformed, this is what was holding the jumper back and not allowing it to extend. I used my razor knife to trim the melted blobs away and to slightly reshape the slots that the jumper slides into. I didn’t want to trim too much plastic away since that would allow the jumper to shift around. After trimming the melted bits away I cleaned the copper contacts and jumpers with some electric degreaser and 1000 grit sand paper. I also stretched the spring behind the left jumper a little to give it more force. Then I cleaned up the contacts on the black disk and gave everything a light smear of dielectric grease. All back together and working. I lined the white disk up with the mark I made earlier and slid it back into the black disk being careful not to let the jumpers fall out. I then slid the reassembled disks back into the switch and snapped the end cap back on. 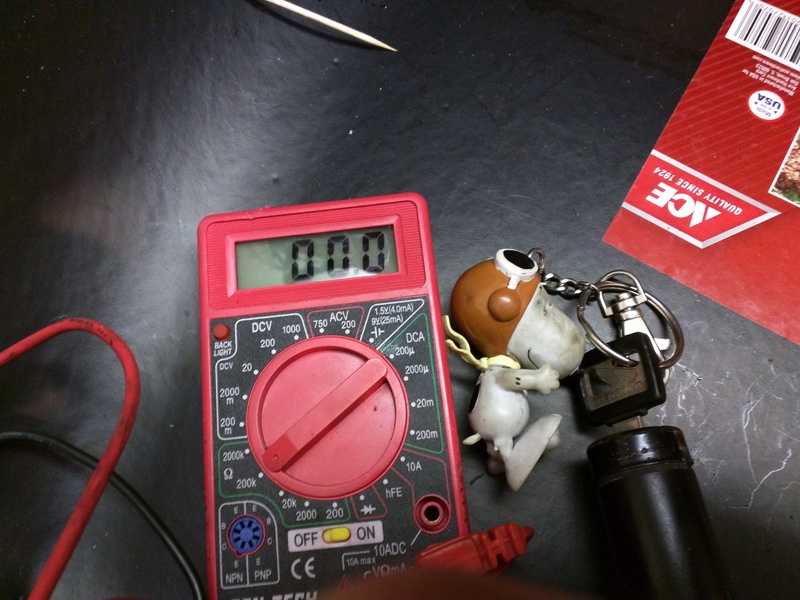 I turned the key to ON and P and tested the appropriate circuits. All tested good! Key is in, lights are on! 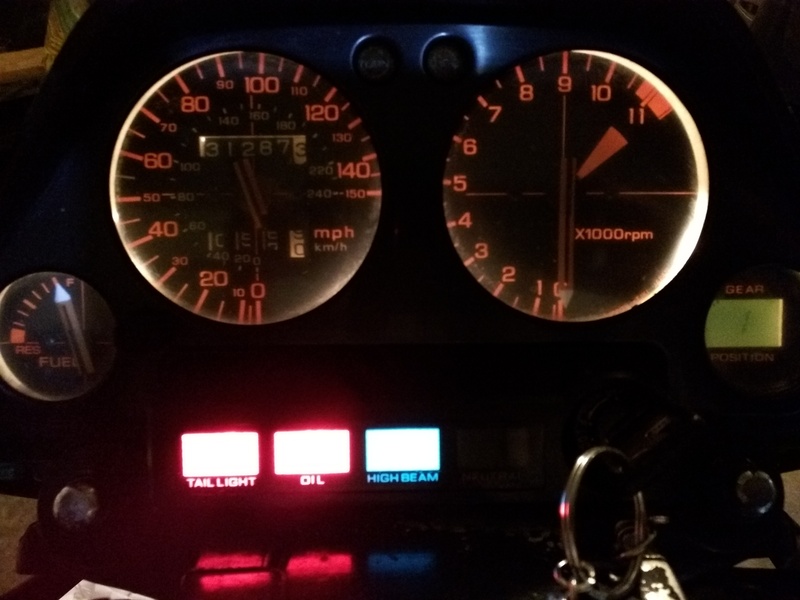 The ignition switch reinstalled, key turned on, dash lights up! The bike is running again. I hope this doesn’t get me kicked out of the Bad Ignition Switch Club! ok, this is fabulous! Thanks for doing what I only considered doing, taking pictures. 2. When trimming the white plastic contact holder of melted plastic, make sure you trim the melties flush as well. I did all these steps once and still had issues. 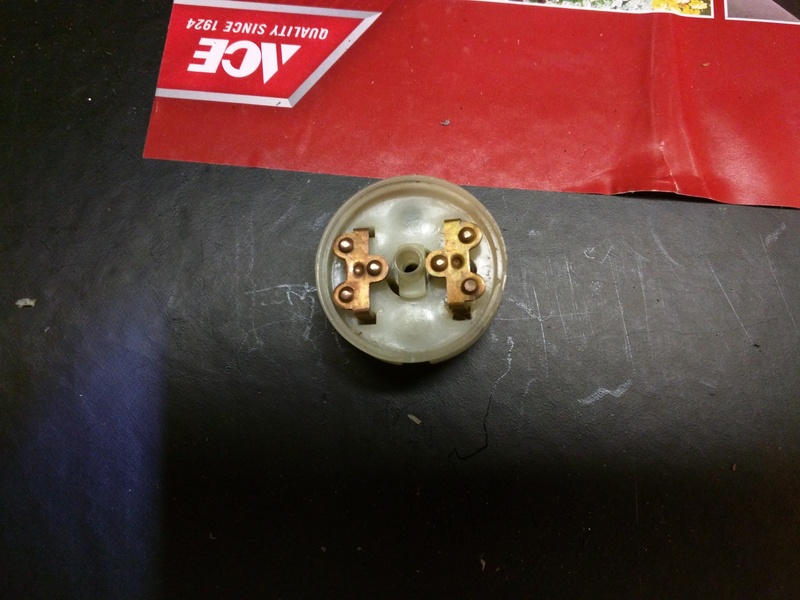 I had a situation where the more compressed the re-assembled parts, the more flaky the connection. 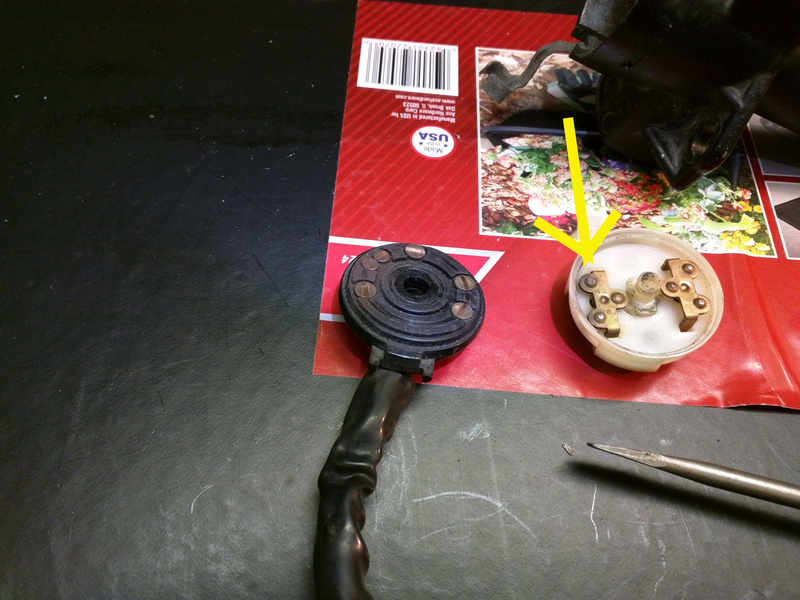 If the floating metal contact cannot compress the spring and seat itself completely flush in the white carrier, when compressed, it will tweak the contacts at an angle and cause one side of the floating copper contact to lift away from the part that the wire is connected to. 3. 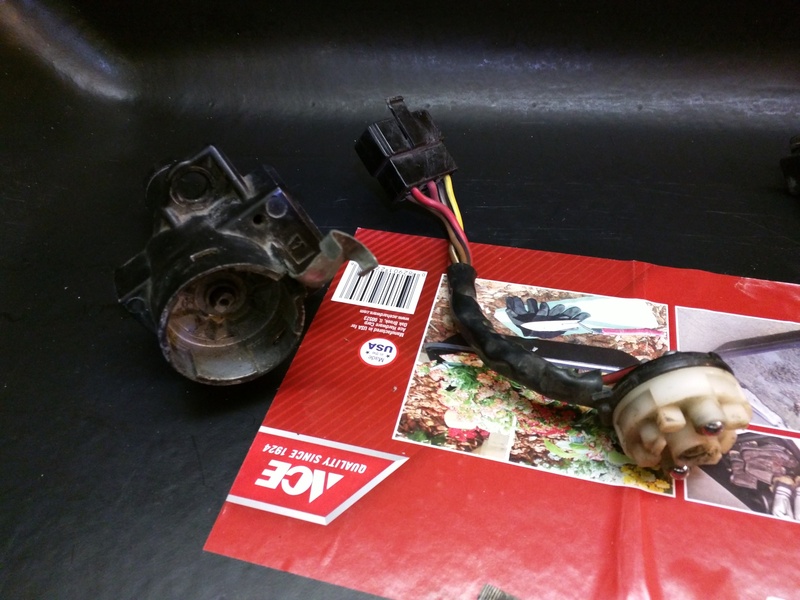 It may also help some to note that the metal dog that extends from the mechanical part, the part that actually turns the plastic parts, is slightly keystone shaped. It is not meant to go together in either 0 degrees or 180 degrees. If you are turning the key after you have it apart you can possibly get the thing re-assembled wrong. Knowing this will give you confidence to know that when you test it or finallt snap it all back together, that it is right.